Squirrels are small- to medium-sized rodents that are found on every continent, with the exception of Australia. With more than 200 species, squirrels occupy a variety of habitats, but most live in trees and build nests inside tree cavities -- called dens -- or in the crotch of tree limbs, referred to as dreys. When building dreys, squirrels use materials that are handy, depending on the particular habitat in which they reside. 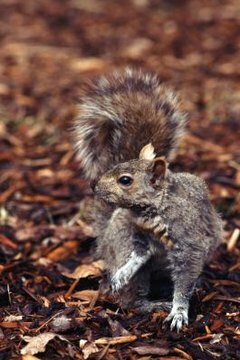 Eastern gray squirrels often use leaves, bark and twigs of deciduous trees such as oak, beech and elm. In the Pacific Northwest, flying squirrels use lichen as the main material for constructing dreys. They use softer materials, such as pine needles and grass, to line the interior. To construct a drey, squirrels roughly weave together twigs to form a platform, then compact leaves atop it to form a base. Around the base will be more woven twigs, forming a rough spherical shape for the outer shell. They use more moss, twigs, leaves and found items such as paper to fill in the gaps. In winter, squirrels build dreys in layers. An entrance hole will face the tree, and some squirrels will leave an additional hole which can be used for escape if necessary. Adult squirrels often build two dreys so they have an option if one is disturbed. Squirrel nests are usually near the main trunk of the tree, in a crotch where several small branches meet, or on a strong, thick limb. Dreys are generally at least 20 feet up the tree. Some species, such as flying squirrels, tend to build their nests higher. Dreys are camouflaged in the summer by the tree’s leaves and difficult to see, but in winter they become visible as the tree loses its leaves. Dreys are subject to the seasons and squirrels must constantly maintain them to keep them safe and dry, replenishing leaves and twigs as necessary. The average drey is only used for a year or two before it is abandoned, although remnants of the nest can be visible for years. West Virginia Wildlife Magazine: What's That Clump of Leaves?